When it comes to restoring your teeth, you can trust Riverheart Family Dentistry to deliver results that are long lasting and beautiful. Composite fillings are a cosmetic dental treatment primarily used to repair a tooth from decay or trauma. This type of dental filling is made of highest quality material and custom made to match the natural color and form of your teeth. 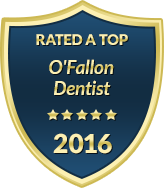 As an experienced and reputable dentist in O'Fallon, Dr. Schwarz is highly qualified to restore your smile the way you deserve. We always build smiles for optimal health and function, but we work with dedicated adherence to the aesthetics of your smile as well. When you choose Riverheart Family Dentistry, your family is in good hands. We treat our patients with the superior, personalized care and we make every effort to keep them comfortable at all times. Our office proudly offers state-of-the-art dentistry in an environment that feels like home. For patients who need it, we provide sedation dentistry during a composite filling procedure or other cosmetic dental service. Our cosmetic dental services, such as composite fillings, can erase minor flaws in your teeth or treat an area of decay with beautiful, seamless results. We use composite resin as the preferred filling material of choice. Composite resin is a tooth-colored mixture composed of plastic and glass. It is placed in layers and sculpted by Dr. Schwarz before it is hardened and polished using special tools. While this natural colored filling can successfully repair a decayed tooth, Dr. Schwarz can also use composite resin cosmetically to correct a chipped, discolored or misshapen tooth. Compared to other filling materials, such as amalgam (mercury) fillings, composite resin is superior in safety, aesthetics and longevity. In general, a dental filling procedure is quick and cost-effective, yet it can provide significant smile improvements. To learn more about what to expect during your appointment, please contact us today. At Riverheart Family Dentistry, we rebuild smiles in the most comfortable and convenient way possible. We invite you to experience dental care with us – your new smile is waiting.